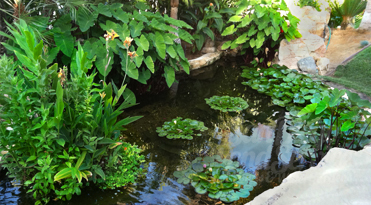 POND SERVICES: San Diego Pond Service specializes in keeping ponds clean, healthy, and looking beautiful. Our company is experienced in maintaining all types of filter, pump, and UV equipment. Caring for koi ponds, water gardens, and even "green" fountains is our passion. We are licensed & insured pond care pros. 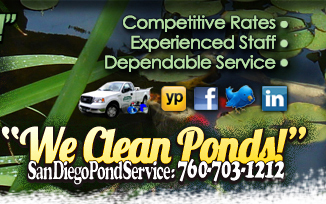 If you are looking for a denpendable, reliable pond care company, call SDPS today, and leave the dirty work to us! POND SERVICES: We enjoy all aspects of pond maintenance including koi care, pond ecosystem management, the role of aquatic plants, and proper pond filter system care. Understanding this delicate balance is the key to a clean, healthy koi pond habitat. Our services include: Pond Consultations, Maintenance, Pond Cean-Outs, Powerwashing, Pond Vacuuming, Muck Removal, Filter Cleaning, Pump Maintenance, UV Service, Algae Control, Aquatic Plant Management, and Water Testing. POND MAINTENANCE PROGRAMS: SDPS is a full service pond maintenance company that offers routine, regular pond service. Each pond is different and some ponds require more work than others. Based on your type of pond, our staff can determine which maintenanca program would suit your needs. Call SDPS for pricing or to schedule a consultation to assess your pond's needs. POND PLANT MANAGEMENT: Aquatic plant life really adds to the beauty of your pond. Submerged, floating, bog, lotus, and lily plants have exotic seasonal flowers that are extremely rewarding for pond owners. SDPS can get the most out of your aquatic pond plants. Enjoy the benefits of year-round blooms and manicured foliage growth. From Japanse water gardens to natural pondscapes, we will achieve the look yo're dreaming of! 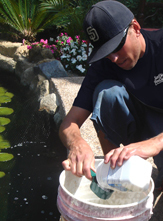 KOI MEDICATING: San Diego Pond Service is experienced in diagnosing and treating many types of common koi pond parasites, diseases, and illnesses. Koi medicating is tricky and there are no guarantees for a full recovery. We are proud to say we have successfully treated numerous ponds and koi for many common ailments. The earlier your treat your koi's illness, the better your koi has a chance for a full recovery. Hesitating on treatment could result in an untreatable koi. Koi recovery is fickle, so early treatment is vital. From parasites, to lesions, to stress, to fungal sicknesses, SDPS has got you covered. We can treat your entire pond, or we also offer isolated koi baths and dips to specifically target the diseased koi. If you think you have a sick koi or your pond is in need of medication, don't hesitate to call San Diego Pond Service today (760-703-1212) to schedule a koi health consultation. POND CLEAN-OUTS: Pond owners and hobbyists know how quickly their beautiful koi pond or water garden can turn into a ugly, dirty, overgrown algae swamp. San Diego Pond Service offers pond clean-outs for all types of neglected ponds. Large or small, liner ponds or concrete ponds, we are equipped for the job. Clean-outs consist of 100% water change, aquatic plant management, muck removal, powerwashing, filter/pump care, water conditioning, and bacteria boost. We can get your pond looking new again. POND DRAINING: Looking to drain your pond? We have experience draining ponds up to 100,000 gallons! Irrigate your property with our "Go Green" program! Recycled pond water and filter waste is a great source of fertilization for your landscape. We utilize the drained pond water and apply it to your gardens, shrubs, trees, and lawns. We are water wise and do our best to conserve water at all times. EQUIPMENT SET-UP: Crucial, key components to the overall health and aesthetics of your pond is your filter system. No matter what type of pond filter system you have, it is going to require proper installation and maintenance. 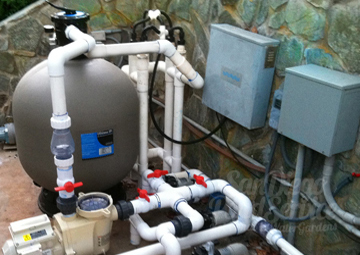 From simple submersible bio-filters to extensive bio-mechanlcal filter systems, San Diego Pond Service is well versed in all types of filter equipment, pond pumps, and UV Systems. It is very important to install the correct equipment for the size of your pond and the fish waste loads you expect your filter to handle. Questions? Call us to schedule a consultation. KOI HANDLING: Have ? 's regarding how your pond care company handles your prize koi? 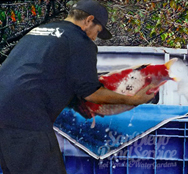 Rest easy, knowing SDPS maintenance technicians have years of experience catching, netting, transferring, housing, and handling small or large koi. We know these prize jewels are delicate and need to be handled with special care. It is very important to keep their stress levels to a minimum. A great destressor is the use of aquatic salt. Salting your pond or your koi, during situations of high stress, can be crucial in keeping your prize koi calm and relaxed. Salt is also a great way to fight stubborn algae, but be careful, it also destroys beneficial bacteria. POND DECORATION: Stone, rock, and aquatic plant life really adds to the overall decor of your pond and are essential for a healthy pond ecosystem. submerged, bog, or floating pond plants, have exotic seasonal flowers that are extremely rewarding for pond owners. Using potting techniques and effective use of nourishment, SDPS can get the most out of your aquatic plants. Enjoy the benefits of year-round blooms and manicured foliage growth. POND WATER TREATMENTS: Minimize the percentage of partial pond water changes, by using organic or chemical pond water treatments. Ammonia, algae, sludge, pH swings, floating matter, nitrites and nitrates, chlorine, chloramines, and minerals/metals found in ordinary tap water can all be treated with pond water additives. Understanding how and when to use these treatments will help determine their effectiveness. Not knowing how to use these treatment methods can result in fish and plant harm, and sometimes even fish loss. 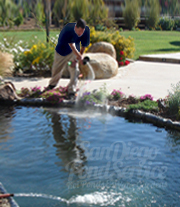 San Diego Pond Service has years of experience with a variety of organic and chemical pond water treatments. Whether you have a large or small pond, we will can your water crystal clear, algae free, and your koi happy! 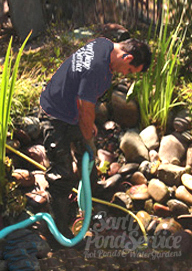 SIGN UP FOR OUR SERVICE: We service ponds all over San Diego county. We love our San Diego ponds, our North County ponds, our coastal ponds, and our inland ponds. From Rancho Santa Fe ponds to La Jolla ponds, we care for each account as if it were our own backyard pond! If you are seeking pond service or koi care, don't hesitate to call us! We offer a variety of maintenance programs including weekly service, bi-weekly service, monthly service and even custom flat rates are available to suit your needs. Call San Diego Pond Service today, (760) 703-1212, to schedule a consultation and configure your program or custom rate.